The Samsung Galaxy M30 is especially created for the millennials who live on the edge and do not compromise on anything. With a beautiful infinity U cut display, a triple camera setup, a powerful processor and big battery, the Galaxy M30 is a 3X powerful smartphone. The Samsung Galaxy A30 is a mid-range smartphone that comes with a complete bezel-less display. It covers a number of features that make it a perfect choice in this range. It comes with a slim body that sits comfortably on the palms of the handle. Provide a great performance, it is powered with a decent battery backup to keep it running. The camera performance is also very impressive and is sufficient storage to keep all the data in it. The Galaxy A30 is equipped with an octa-core (2.2GHz dual-core, Cortex A73 + 1.6GHz hexa-core, Cortex A53) processor. It is seated upon the Exynos 7 Octa 7885 chipset and assisted by the Mali-G71 MP2 GPU that handles the graphics. The 4GB RAM makes sure there is no lag while gaming or multitasking. In terms of the power backup, it has been provided with a Li-ion battery that can give ample amount of backup to last for long hours. 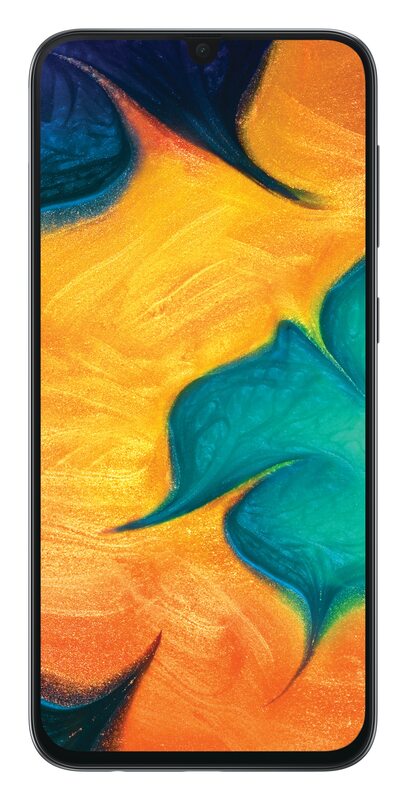 Samsung Galaxy A30 mobile features a 6.4" (16.26 cm) display with a screen resolution of 1080 x 2340 pixels and runs on Android v9.0 (Pie) operating system. Sensors include Fingerprint Sensor, Light sensor, Proximity sensor, Accelerometer.